I’ve been hanging to share this project for a long time. 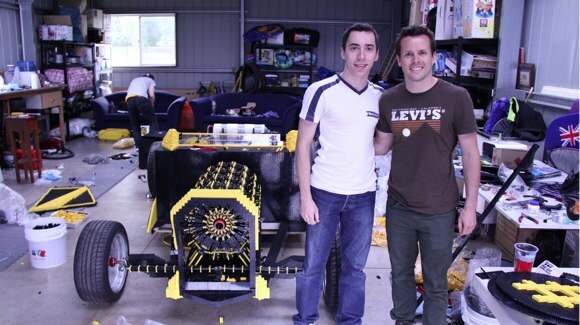 Discover how I helped fund a life size car made from Lego that’s powered by compressed air. Pretty cool huh? But before I get into the details, check out the video! More than 500,000 LEGO pieces were used. The car engine is made from standard Lego pieces and runs on air! The engine has four orbital engines and a total of 256 pistons. It was built in Romania and shipped to a secret location in suburban Melbourne. It’s a Hot Rod design, mainly because hot rods are cool. Now what does this have to do me? Well not only was I one of the original fundraisers but I also donated some of the team’s time from MelbourneVideoProduction.com.au. You can also read a little more about it and listen to an interview I did with Raul Oaida (the car’s architect) here: Life Size Lego Car Powered by Air MP3 Interview. Dave & Raul With Life Size Lego Car Powered by Air. The Super Awesome Micro Project. Anything lego is awesome. There aren’t many toys that remain cool for decades. Engines runs on air, perhaps the future.